Bespoke handmade Marmite gift set made by our team of artisans. 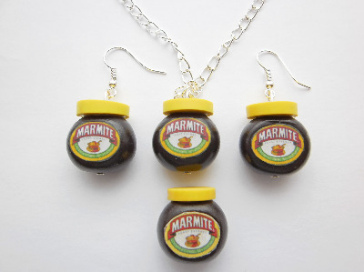 1 pair of silver plated Marmite earrings. 1 silver adjustable Marmite Ring to fit any size finger. 1 18in silver plated Marmite necklace. Marmite pendants made from non-toxic polymer clay. All of our Marmite products comes in a free satin gift box.